The thing that is truly interesting about this format though, is the fact that even though we know all these archetypes are good, there are a variety of different ways they can be built. Golgari ranges from smaller builds featuring Wildgrowth Walker, to larger, greedier builds jamming four Carnage Tyrant. Jeskai Control features as few win conditions as just Teferi, Hero of Dominaria to Adrian Sullivan’s more threat dense build playing four Niv-Mizzet, Parun in the main deck. Izzet Drakes can feature up to 8 drakes, as few as 4, and explore other threats such as Ral, Izzet Viceroy and Murmuring Mystic to have additional ways to close out the game. Even something that feels like it should be straight forward like Boros Aggro has builds featuring Heroic Reinforcements at the top end versus more low to the ground builds looking to leverage Ajani's Pridemate. For me personally though - the thing that makes this format go from great to amazing isn’t the archetype diversity among the best decks. It is the fact that so many different new deck ideas I keep trying seem to have a real chance at being competitive against the top dogs. 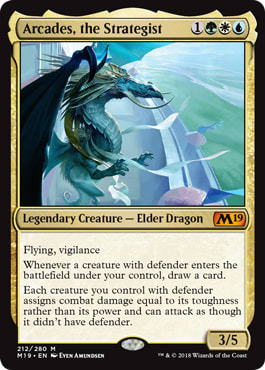 This card not only holds the air reasonably well as a 3/5 flying, vigilant attacker, it also turns our motley crew of defenders into a real force to be reckoned with. The fact that Arcades not only enables our defenders to attack, but also makes them draw cards is very powerful. Arcades allows us to be aggressive when we are ready to close a game out, while also enabling us to grind people out if we aren’t far enough ahead yet. 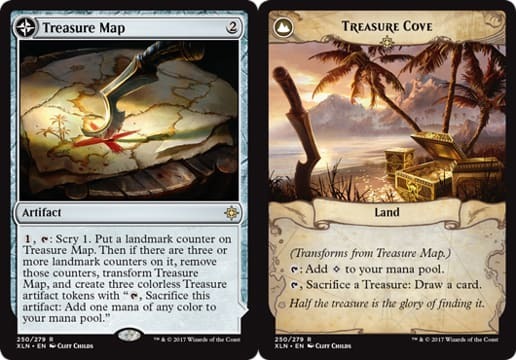 At this point, I think Treasure Map might just be one of the best cards in this format. It does so much for so little. It smooths out our draw by scrying. It accelerates our mana to let us make plays faster against aggressive decks. It generates card advantage so we can out grind control decks. It also pairs incredibly well with our second tool here - Karn, Scion of Urza. Karn draws additional cards every turn on his own. 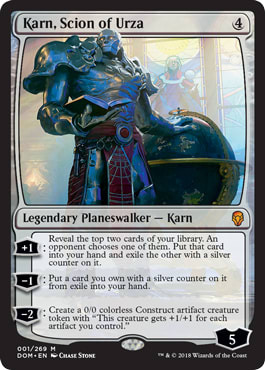 In addition, alongside Treasure Map and various artifact creatures we play, Karn can generate increasingly large threats with his -2 ability that creates constructs. We round out our supplemental card advantage with a couple copies of Vivien Reid. 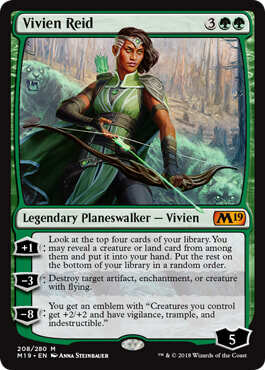 Vivien is one of the most powerful sources of card advantage in this Standard format. Many of the powerful threats in this format have flying and she can also clean up powerful opposing enchantments such as The Eldest Reborn. Past acting as removal - Vivien also digs four cards deep every turn to help us find Arcades, the Strategist more consistently. 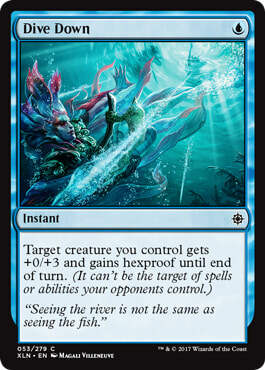 Dive Down is a card that is just fantastic in general in this format. At a base level, it acts as a 1 mana counter spell to protect our key threat of Arcades. 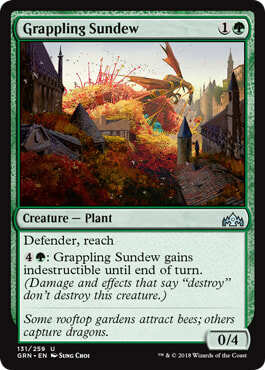 Past just this though - in this deck Arcades also allows us to turn Dive Down into a Giant Growth of sorts in conjunction with our defender creatures. Slaughter the Strong is easily the best card in our deck against anything remotely creature based in the format. 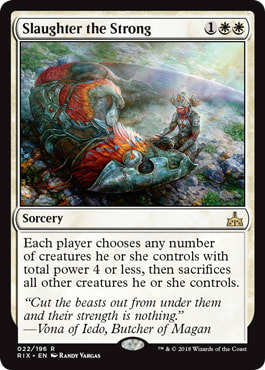 Because our deck is full of blockers, our creature based opponents will often be forced to extend wide onto the board, making Slaughter even more powerful. This card is effectively a one-sided board wipe in many of these situations. Any time we play Slaughter, keeping Arcades and a few walls, we generally put ourselves in a position to win the game very quickly. The core of our creatures are various 0/4s for 2 mana with different marginal upsides. 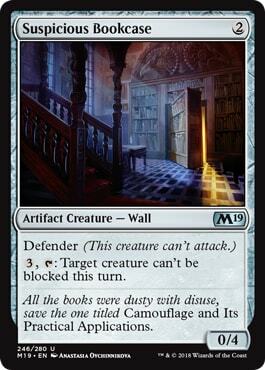 Gleaming Barrier and Suspicious Bookcase are artifacts to synergize with Karn, Scion of Urza a bit. 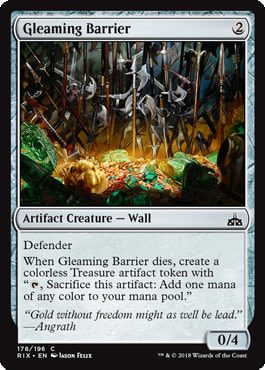 Gleaming Barrier also leaves behind a Treasure which can allow Treasure Cove to draw a card for us. Suspicious Bookcase’s ability may not look like much, but because this deck often generates board stalls, it can often steal games for us. 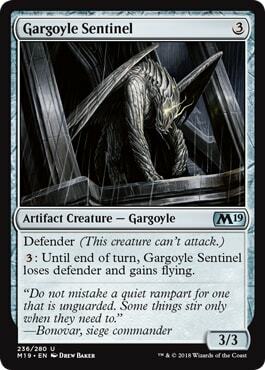 Gargoyle Sentinel is nice because it can attack on its own without Arcades in play, but it also costs 3 mana which makes drawing too many of them clunky. Wall of Vines is very efficient, but it is also the weakest of all our walls. Grappling Sundew is the worst rate in terms of its abilities, but the fact that it is a 0/4 with reach makes it pretty key against the Arclight Phoenix decks. We trim our weakest wall along with our Sentinels because their power does not line up well with us boarding in extra copies of Slaughter the Strong. Teferi, Hero of Dominaria gives us an additional angle of attack and card advantage as they will often have more ways to remove Arcades post board. Similar to Golgari and other interactive decks - we want to lessen our reliance on Arcades post board because they are more likely to be able to remove him from the table. We do this by trimming some of our less impactful walls, along with trimming our Dive Downs and Slaughters for some actual counter spells. This matchup can be a bit hard Game 1 if they have multiple drakes early, but post board we get some quality removal to bring in. The key to winning this matchup is often finding the right balance between how defensive you need to be to survive, while still applying pressure to end the game before they find too many threats. This matchup is pretty good for us - especially post board when we move up to four copies of Slaughter the Strong. Our 0/4s give them all sorts of headaches and Arcades alone can slowly kill them in the air while keeping their attackers at bay thanks to having vigilance. 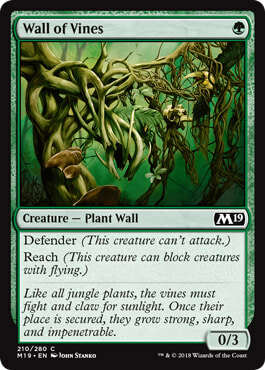 Our walls are great at keeping their creatures in check much like against Boros Aggro. The games we lose to Mono Red generally involve getting burned out after an initial attack or an unchecked Experimental Frenzy running away with the game. What started off as a joke deck submission really felt like it came together in this deck list. Arcades is doing something uniquely powerful when he gets going and the backup plan of Karn generating constructs is also good in conjunction with our artifacts. If you are interested in seeing some iterations of this archetype in action you can find a few videos of it on my YouTube channel here.